Members along with MAB continue to monitor the infamous Y2K bug. MAB battles Low Power FM in Washington DC while encouraging Michigan’s delegates to support HR 3439. MAB joins other state broadcast associations to contest the FCC’s action of establishing EEO requirements. This initiative continues throughout the first decade of the new century. Amber Alert program is first launched in June 2001. 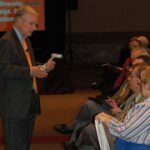 MAB works with various organizations for a number of years to improve this program for Michigan and even battles copycat programs. In an effort to help Michigan stations save in energy costs, MAB launches the Energy Choice Program. 2000 Michigan Census enlists Michigan stations for assistance through the MAB’s NCSA program. To assist members with the new EEO rules, MAB and MAB Foundation begin to offer EEO-friendly programs such a career fairs, judging the student awards and cross-training. MAB begins the Alternative Broadcast Inspection Program (ABIP). Children’s Trust Fund (CTF) initiative joins the NCSA program. This campaign included a license plate program as well as the “kids pins”. In the State Legislature, MAB and its members, battle issues with Casino Gaming. April 2001 – MAB pledges $100,000 to the James H. and Mary B. Quello Center for Telecommunications Management and Law at Michigan State University. June 2001 – MAB members complete a survey and strategic plan that helps create a new mission for the MAB. Michigan stations take action after the terrorist attacks of September 11, 2001. In addition, the Michigan Army National Guard campaign as part of the MAB’s NCSA program becomes even more important. December 2001 – To better serve the engineering and technical needs of its members, MAB creates a new Director of Technology position and hires Larry Estlack. May 2002 – MAB adds new Engineering Hotline to list of member services. After the 2000 census, the Michigan reapportions its Congressional Districts leaving Michigan citizens with one less seat. 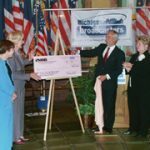 NAB and MAB announced that Michigan broadcasters provided $328 million in community service in 2001. 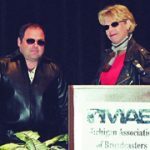 MAB publishes an official publication to share this news with lawmakers and supporters of Michigan broadcasting. July 2002 – MAB receives a grant from the Federal Emergency Management Agency (FEMA) for EAS improvements. FCC begins review of Broadcast Ownership Rules. Fall 2002 – Broadcasters and Educators meet for the first-ever Broadcaster/Educator Summit. 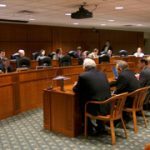 January 2003 – MAB and broadcasters battle Advertising Tax in Lansing. January 2003 – MAB introduces a new format for the MAB newsletter. 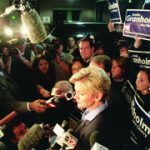 January 1, 2003 – Governor Jennifer M. Granholm is sworn in as Michigan’s 47th Governor. MAB and Michigan stations coordinated to offer live coverage of the inauguration. 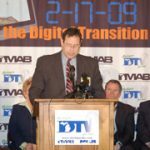 March 2004 – MAB partners with MAPB to kick off the “Michigan DTV for Me” campaign to prepare Michigan broadcasters and citizens for the impending transition to Digital Television. Michigan stations combat “Localism Hearings” and, with the help of MAB, set-out to prove that Michigan broadcasters are local and serve their communities. MAB and NAB announce that Michigan stations provided $308 million in community service throughout 2003. March 2005 – MAB launches Radio Research Project to test consumer attitudes toward local radio and newer competing audio services. The project results were very favorable to over-the-air radio broadcasters. 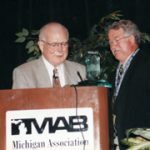 July 2005 – MAB launches the Michigan Association of Broadcasters Political Action Committee (MABPAC). 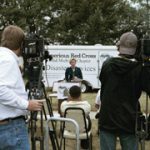 September 2005 – MAB and Michigan stations join Governor Granholm with the Michigan Cares, Michigan Gives public service campaign to aid victims of the recent hurricanes. 2005 – TV stations deal with mandated and changing deadlines for the transition to digital television which, became a costly venture for most stations. Radio stations deal with HR998 the Local Emergency Radio Service Preservation Act of 2005. 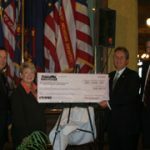 September 2006 – NAB and MAB announce that Michigan stations provided $330 million in community service throughout 2005. November 2007 – MAB launches “Countdown to 2-17-09 The Digital Transition” campaign. This campaign was designed to educate member stations so they might better serve their communities on the transition. January 2008 – MAB introduces the new electronic form of the MAB newsletter. 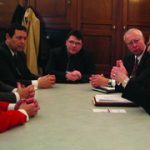 February 20, 2008 – MAB holds Digital Day at the State Capitol to educate Michigan legislators on the pending transition to Digital Television deadline on February 17, 2009. Digital Day included a news conference, educational training session, reception and a visit from the NAB’s DTV Road Show truck. 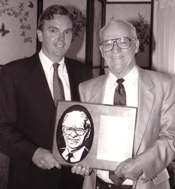 Hall of Fame sportscaster Ernie Harwell joined the effort as the PSA spokesperson. March 2008 – GLBC is moved to the DeVos Place in Grand Rapids for the first-time. The two-year run ends in March 2010 when the show will return to Lansing’s Lansing Center. Spring 2008 – White spaces becomes a bigger issue in DC as well as LPTV and Localism. January 2009 – In his first few weeks of office, President Barack Obama pushes Congress to extend the Digital Transition date from February 17, 2009 to June 12, 2009, which passes. This change puts financial strain on Michigan stations who had budgeted to end analog signals and sell unused equipment after the 17th. Spring 2009 – Radio stations battle a proposed Performance Tax that could costs Michigan stations millions. 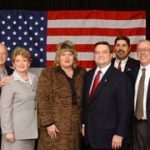 Past Chairmen from 2000-2009 include: 99-00 Edward E. Essick; 00-01 Judy D. Kenney; 01-02 Curtis W. Smith; 02-03 Susan E. Goldsen; 03 Eduardo Fernandez (partial term); 04 Jeffrey J. Scarpelli (partial term); 04-05 Joseph Berwanger; 05-06 Julie Koehn; 06-07 Mario Iacobelli; 07-08 Bart Brandmiller; 08-09 Diane Kniowski. 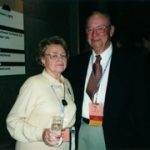 MAB President 1956 Carl Lee (right) and his wife Winnie during the 2000 Annual Meeting and Management Retreat at Crystal Mountain. 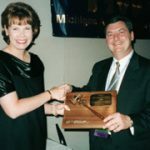 Judy Kenney, MAB Chairman 2001, presents the gavel plaque to outgoing Chairman Skip Essick, MAB Chairman 2000 at Crystal Mountain Resort in 2001. 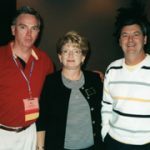 (l-r) Bob Ottaway, MAB President 1992, Karole White and Skip Essick, MAB Chairman 2000. 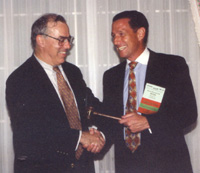 (right) MAB Chairman 2002 Curt Smith presents the 2002 Lifetime Achievement Award to Joe Blake. 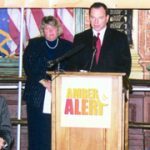 MAB celebrates the success of the Amber Alert Program in 2004 during a news conference at the Capitol. At the podium is Jeff Scarpelli, MAB Chairman 2004 with Sue Goldsen, MAB Chairman 2003. Presenting the ceremonial check in September, 2004 of $308 million in Community Service to Michigan citizens are (r-l) Karole White and Joe Berwanger, MAB Chairman 2005.Receiving the check on behalf of Michigan citizens are (l-r) Senator Liz Brater (D-18th) and Representative Patricia Birkholz (R-24th). MAB forms the MABPAC in 2005. 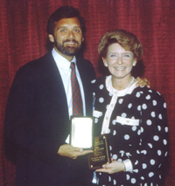 Pictured are the “Leaders of the PAC” (ie: Bruce Goldsen, MAB Chairman 1998 and Judy Kenney, MAB Chairman 2001). MAB Members Gary Blievernicht, WKAR; Al Blinke, WNEM; Mike King, WILX and Karole White testify before the 2008 House Energy and Technology Committee. The State Leadership Conference, presented by the NAB, welcomes MAB board members to Washington, DC. 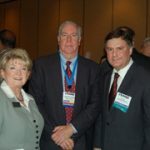 Pictured at the 2003 event are (l-r) Tom Scanlan, MAB President 1995; Karole White; Sue Goldsen, MAB Chairman 2003; Eddie Fritts, NAB President/CEO; Ed Fernandez, MAB Chairman 2004; and Stephen Trivers, MAB President 1996. Karole White addresses Detroit community members during a DTV presentation at the Detroit Public Library in late 2008. 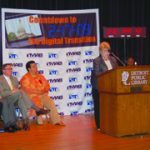 DTV Day at the Capitol kicked off a year-long MAB campaign to better prepare Michigan stations and citizens for the transition to Digital Television. Pictured speaking during the February 20, 2008 news conference is Bart Brandmiller, MAB Chairman 2008. Karole White, Jim Lutton and Senator Cameron Brown (R-16th) during the 2009 Legislative Reception held February 11 at the Radisson Hotel. The 2006 Gubernatorial Debates between Governor Jennifer M. Granholm and Richard DeVos involved many MAB members. (back row, l-r) Julie Brinks; Matt Kreiner; Tom Bryson, MAB Preseident 1990; and Al Blinke. 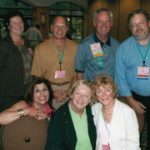 (front row, l-r) Marlene Kreiner, Mary Bryson and Ann MacDonald during he 2006 Annual Conference at Boyne Mountain Resort. MAB and member stations partner with the Governor’s office in September, 2005 for the “Michigan Cares, Michigan Gives” campaign aiding victims of the summer hurricanes. Members meet with Governor Jennifer Granholm during a special reception at the Governor’s residence. 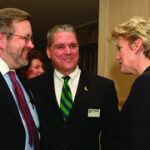 Pictured (l-r) are Al Blinke; Scott Meier and Governor Granholm. (l-r) Bart Brandmiller, MAB Chairman 2008 and Karole White present a ceremonial check to Represenative Mike Nofs (R-62nd) and Representative Andy Dillon (D-17th) on behalf of Michigan citizens to represent the more than $330 million Michigan Broadcasters donated in Community Service in 2005. 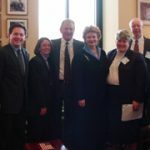 During Call on Congress 2005 (l-r) Peter Tanz; Chris Monk; Julie Koehn, MAB Chairman 1983; Senator Debbie Stabenow; Sue Goldsen, MAB Chairman 2003; Bill Wertz and Karole White. 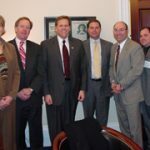 During Call on Congress 2005 (l-r) Judy Kenney, MAB Chairman 2001; Ken MacDonald; Congressman Mike Rogers (R-8th); Mike King; Rob David and Bruce Goldsen, MAB Chairman 1998.